The Bible’s book of Ruth is a postage stamp-sized town by a scriptural freeway. Blink and you’ll miss it. Between Eden and the City of David, between the mythological creation of the world and the political creation of the “Promised Land,” Ruth—the non-Jew—shyly waves a greeting and beckons the reader to stop and set a spell. She’s a quick read. If you sip a favorite tea or coffee when you turn to the first verse, your drink would still be warm when you finished. With Ruth, there’s no need for a refill. And yet, within those sparse verses are some of the most magnificent words of the Bible. I have used this singular verse, these words that are a few grains of sand on the Biblical beach, in a myriad of places. I’ve opened my Bible to Ruth 1:16-17 at weddings, both same and different gender, for elaborate funerals and stark graveside services. One hurt and vulnerable person promises another hurt and vulnerable person: I will be with you. The remnants of a blended family declare: I will be with you. A non-Jew vows to a Jew: I will be with you. And I don’t hesitate to take the specific to a universal, as I imagine a person of one faith saying to a person of a different faith: I will be with you. In a time of celebration: I will be with you. In a time of tragedy: I will be with you. Ruth’s first chapter prompts a reader to wonder, whether several millennia ago or today, how much difference is there between me and someone I might call “foreigner?” And the answer . . . not much. Once I had a back-and-forth with my father about “foreign” cars. He said something like—this happened in the 1980s—that he always bought American-made cars. 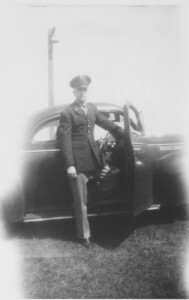 Dad loved automobiles, especially Chryslers. He didn’t smoke or drink but he “did” cars. By their 40th wedding anniversary, Mom calculated Dad had owned 40 cars. More would follow. He enjoyed the endless quest for the elusive perfect car. Until the final car he purchased (a Toyota), all were “American.” But in that decades-ago chat, I suggested cars had become global, that parts for German cars were imported from Japan and vehicles rolling out of Detroit were dependent upon South American manufacturers. And so forth. I recall this conversation for several reasons. Amazingly, Dad didn’t argue with me! Dad, like many in his generation of World War II veterans, viewed the United States as superior to anywhere else. America first! But he saw the changes—good, bad and ever evolving—forming a global economy. Maybe “foreign” wasn’t so foreign after all. And, with a nod to the book of Ruth, I sensed Dad being with and for me in our father-son talk. In the journey of father and son, of different generations and values, our love had matured. It goes deeper. Dad died on February 6, 2012. As I’ve mentioned before, he struggled with dementia in his final years. We formally knew about his illness for perhaps two or three years. But dementia is insidious. In hindsight, it’s likely the disease had been eroding his memory and personality for a long while. In my dark days, in vulnerable times, I wonder: when was the last time I had a “real” conversation with Dad? It’s a useless question, but it haunts me because I can’t remember. Was it a time where he talked about his childhood? Or when we, like manly men, discussed how awful the 49ers or Giants were? Did we talk about a book he’d read or a sermon I’d given? And so I treasure the memories I can claim for sure, the ones where I sensed his love and trust and devotion to me. For me, re-reading Ruth 1:16’s singular verse transformed a trivial chat that Dad and I once had about “foreign” cars into something special. I cherish moments where I know how much Dad loved me, and where his devotion for me, and my devotion for him, was revealed by treating each other as equals. Ruth set an example for everyone. There she was, in a book a few pages long, a woman glimpsed between Eden and the City of David, sharing profound words of love. Who do you need to turn to today, in the journey of your life, and openly, honestly say, “I will be with you.” Don’t wait. Don’t wait. Hey, even my older sister reads my stuff. Thanks, Val!